At JTB Electrical, we have worked hard to establish our electrician in Southampton reputation. We have over 50 years of combined experience in the industry. Whether you need PAT testing, electrical system testing or CCTV installed, we are the company to choose. All services provided will be completed to NICEIC standards. At JTB Electrical, we are the first choice electrician in Southampton for homeowners and businesses. Whether you need us to conduct PAT testing or rewiring of the property, we will work hard on all jobs. We supply a comprehensive domestic electrician Southampton service. Our services are extremely diverse and we design and supply installations in the local area. We possess the skills to work on domestic properties of all sizes. You can expect our company will work hard on all jobs be it electrical rewiring or burglar alarm installation. Every job will be completed in accordance with the latest electrical regulations. The Part P Building Regulations outlines that new domestic work must be completed by a registered company like JTB Electrical. We have the qualifications and expertise to work on all types of jobs from whole property rewiring to installing security cameras and more. Need a commercial Southampton electrician? Look no further than JTB Electrical. We have a wealth of experience in commercial electrical work that is untouched. Our testing and inspection service is suitable for properties of all sizes. We have the facilities to test a few devices to a whole building, no job is too big or small for our team. We always work according to the BS 7671 standards which are in accordance to the 17th Edition of the IEE Wiring Regulations. All work will be self-certified by our electrician in Southampton employees regardless of the job. If you choose exterior flood lighting or a larger job such as fire alarm installation, you can relax knowing the experts are on the job. We are registered members of the NICEIC. Therefore we always work to a high standard. Our work means we supply everything from the design, installation and commissioning of electrical projects. If your property does not have access control systems, then we are the company to choose. We will assess your needs and then design a tailor-made system that will fit in perfectly. Testing and inspection is vital for ensuring that your property’s electrical system is fit to use. We tailor every service to meet your Southampton electrician requirements and budget. With a wealth of experience, we have provided testing and inspection for clients such as Sainsbury’s and Hampshire County Council to name a few. Once the inspection has been completed, we will supply you with a report that outlines what we discovered. This service allows us to tackle problems before they worsen. PAT testing is another service we supply. It is vital that your devices are tested annually otherwise there could be hidden faults. Our electrician in Southampton team will work hard to make sure that your property is fit to operate. If you have any questions, do not hesitate to get in touch. At JTB Electrical, we are the first choice for customers that need the best Southampton electrician. Our experience in the industry is unmatched for expertise and years in the industry. You can expect that we will deliver an excellent service at all times. If you need help at any time, we have a fast reactive maintenance service. The team will work hard to get your systems back to normal. We provide an electrician Southampton service to all sectors from domestic, commercial and industrial. All jobs regardless of how big or small will be completed to the highest standards by our team. Our hard work has been rewarded over the past 10 years with exclusive contracts from many respected companies. 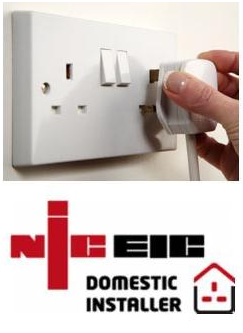 With a wealth of memberships for organisations such as NICEIC, you can expect that we will deliver a service befitting of our electrician Southampton reputation. These organisations only allow companies that meet their high exacting standards. Therefore, you can be assured that we will provide you with quality workmanship at all times regardless of the service chosen. View our gallery today for previous examples of our work. For the best electrician in Southampton call JTB Electrical today on 023 80 731575.